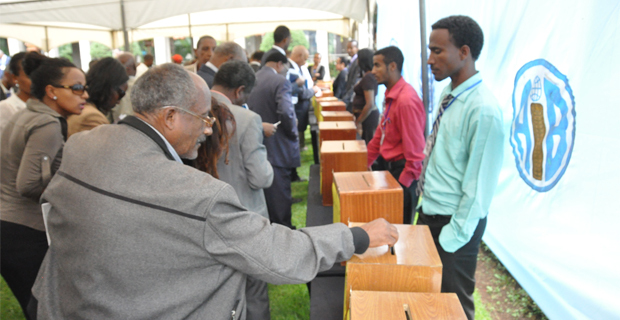 Shareholders of Awash International Bank, the oldest private bank in the country, were busy right after their 18th annual meeting on Saturday, November 16, 2013, when they had to queue and cast votes for board members. The Bank performed well despite stiff competition and several other challenges, among which slowdown of exports due to a fall in international price of primary products, was the major one. Total deposits, according to its annual audited report released during Saturday’s meeting rose by 3.5 billion Br, an increment of 37pc compared to that of last year. Awash still hopes to provide quality service, expertise and integrity in the banking sector, despite persistent challenges such as branch expansion and National Bank of Ethiopia (NBE) bill purchase.